(《複数形》 okapis，okapi) 【動物, 動物学】 オカピ 《アフリカ中部産; giraffe に似るがそれより小さい》. 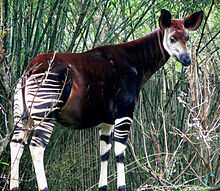 A large ruminant mammal, Okapia johnstoni, found in the rainforests of the Congo, related to the giraffe, but with a much shorter neck, a reddish brown coat and zebra-like stripes on its hindquarters. I used to listen to him with a rapt attention that I thought rather suited me, and then one day I quite modestly gave the dimensions of an okapi I had shot in the Lincolnshire fens. The okapi (pronounced /oʊˈkɑːpiː/), Okapia johnstoni, is a giraffid artiodactyl mammal native to the Ituri Rainforest, located in the northeast of the Democratic Republic of the Congo, in Central Africa. Although the okapi bears striped markings reminiscent of the zebra, it is most closely related to the giraffe.